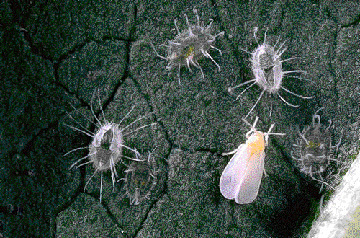 The life cycle and number of eggs laid by the greenhouse whitefly (GHWF) varies with the temperature and the species of the host plant. Eggplant is one of the most favorite vegetable plants of the GHWF. The GHWF will lay nearly 4 times as many eggs on an eggplant as it will on a cucumber plant. It will lay several times more eggs on a cucumber plant than on a tomato plant. The GHWF will usually avoid sweet pepper plants. Developmental time (egg to adult) for the GHWF can take from 123 days at 54° F. to only 18 days at 86° F. GHWF eggs hatch and go through several instars (stages of larval growth) while attached to the undersides of leaves. Shortly after hatching, the GHWF larvae attaches into the leaf tissue and begins feeding on plant fluids. It remains attached until it emerges as an adult. While attached, the larvae is covered with a protective skeleton that makes it difficult to kill with insecticides. Adults can begin laying 4-10 eggs per day within 1-2 days after emergence. As the various stages of the GHWF feeds on the plant, it excretes large amounts of honeydew. A black sooty mold can grow on the honeydew that can interfere with leaf photosynthesis and transpiration. 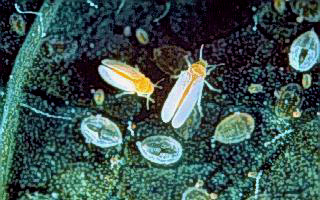 The life cycle and number of eggs laid by the silverleaf whitefly (SLWF) varies with the temperature and the species of the host plant. Bemisia tabaci was reported in Florida as long ago as 1894, but only in the past few years has it become a major pest in the United States. It is a serious pest of many economically important field and greenhouse crops. Often the worst damage results from honeydew (a sweet secretion) that both nymphs and adults drop onto the upper surfaces of leaves. Honeydew supports the growth of sooty mold that damages plants by screening out sunlight. In some areas, SLWF causes great indirect damage by transmitting plant virus. Sometimes SLWF may become so abundant that direct feeding damage kills the crops even before sooty mold and viruses can develop. SLWF is known to attack more than 500 species of plants, many of them economically important. The list includes cabbage, cotton, melons, poinsettia, squash, tomato, and many other ornamental and vegetable crops. Nationwide, dollar losses have exceeded $200 million annually. Entomologists believe that the recent economic losses are being caused by a new strain of SLWF (biotype B), or perhaps even a new species –Bemisia argentifolii. Since this new whitefly is much more resistant to insecticides than the old SLWF, biological control is a desirable alternative. all information on SLWF is from the USDA in Mission TX. This is a site from the USDA on Whitefly identification.